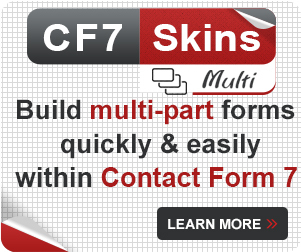 The Contact Form 7 (CF7) plugin successfully sends millions of emails every day. Still, many do not send or arrive. This is often because the Contact Form 7 From: email address mail setting is incorrect. A simple and effective way to avoid most problems is to always use an email address that belongs to the same domain as your WordPress site in the From: field. How to use ‘Additional Headers’ to set up a reply address. 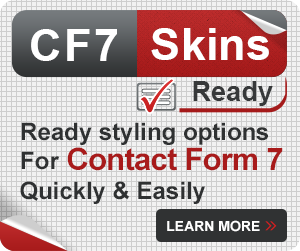 In Contact Form 7, the Mail tab/section is where you enter the From: email address. What you put in this field can be very important and determine if an email can be sent or received. Because the Contact Form 7 email is being sent from your website, it really needs to be seen as coming from your website. Tip: [your-name] <[your-email]> uses correct email format to send an email to the form user. Otherwise it’s now likely that some of your CF7 emails will be rejected as spam somewhere. Go to Your CF7 email may be treated as SPAM for a more detailed explanation of the issue and how to fix it. Some Contact Form 7 users assume the From: field should be the email address of the person submitting the form – but this is usually a really bad idea. 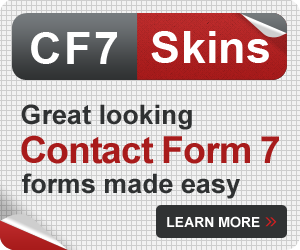 It’s important to realize that Contact Form 7 is using the normal email sending process, when it sends an email, after a user fills in a form on your site. It’s using WordPress to do it, but it’s really no different from you sending an email from your computer. If you use the customers email address in the From: field, then you are effectively sending an email from an email address with their domain name … and you’re doing that from your website which has a different domain name. The big problem is that is also what spammers do when they send out 1000’s of emails – it’s called email spoofing. So when you do this, you may look like a spammer to many mail servers around the world. If you use a customers email address in the From field, it is now likely that some your form emails will be rejected as spam by many mail providers. Another common error is using your ‘usual’ or personal email address in the From: field. 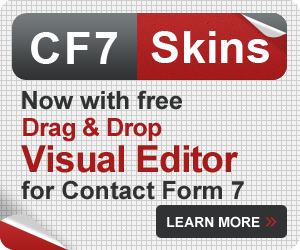 For example, let’s say your usual email is cf7pro@gmail.com and you enter this as the From: address. Nowadays that’s likely to be a problem, because your Gmail email address is not hosted on your website domain – it’s hosted by Google on their big flash mail servers. Because your Contact Form 7 form is sending an email with a From: email address domain that doesn’t match your website domain, you again look like a spammer to the world’s mail servers. In fact the email may not even send because gmail.com is not a domain handled by your mail server. Some hosting companies will just not send emails via WordPress unless they are from a valid email address on your website domain. In this case your users may get an error message telling them that the form was not sent. 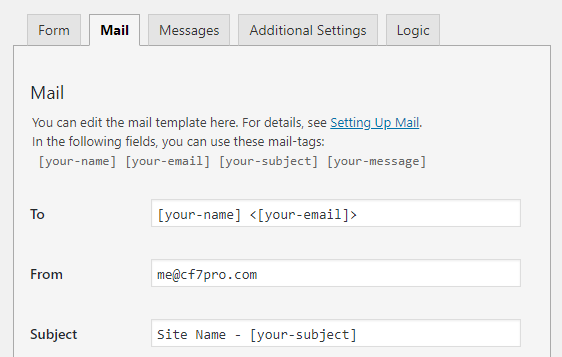 If you do need to use your Gmail address then you may need to use SMTP to send your emails from Contact Form 7. The solution is a very simple one – always use an email address that belongs to the same domain as your WordPress site in the From: field. Let’s say your domain is mysite.com & you have me@mysite.com as a valid email address. Then From: me@mysite.com is a safe option to use to ensure that your form email gets sent & is not seen as spam. If you are sending the form email to others, you also need to remember that people will see this From: email address, just like any normal email, and they will likely reply to this email address. Make sure you are willing to receive reply emails at the email address you use in the From: field. A good rule of thumb is to always use an email address that belongs to the same domain as your WordPress site in the From field in the Mail & Mail(2) sections. Here is an example of typical values you can use to ensure that your form email gets sent & is not seen as spam. Use the correct syntax needed to send an email to the person that submitted the form to you. Use a valid email address on the domain where you host your form. Enter a value for the subject field in case the person submitting the form leaves this field blank. Attention all Yahoo email addresses: There is a particular problem with using Yahoo email addresses as the From: email address – see Yahoo Issue. Many guides recommend using using [your-name] <[your-email]> in the From: field. This format allows a quick and easy way to answer emails that you receive. By clicking reply, you can respond to emails that you receive from people filling in your form. This was very useful in the past, but it’s now increasingly risky. Even if your host allows this, using this format increases the risk of your mail being seen as spam by other mail hosts. If you use the customers email address in the From field, then you are effectively sending an email from an email address with their domain name … and you run the risk of looking like a spammer to the world’s mail servers. Using [your-name] allows you to sort/search via customer name in your email application while noreply@yourdomain.com prevents people from replying to this email address. 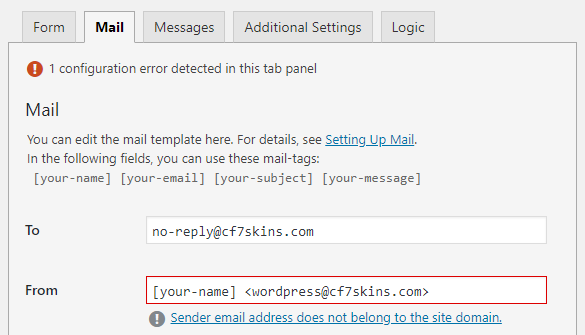 If you leave the From: address in the Mail section of the CF7 interface empty, then by default, the WordPress mailer fills in the email’s From: field as WordPress <wordpress@yourdomain.com>. If you setup wordpress@yourdomain.com as a real e-mail address on your account, your host should pass the email on for delivery. 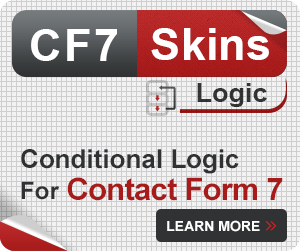 Refer to Your Contact Form 7 email may be going to spam for a more detailed explanation of this issue. To reply to form submissions in your email application, use Reply-to: [your name] <[your email]> in the Additional Headers field. 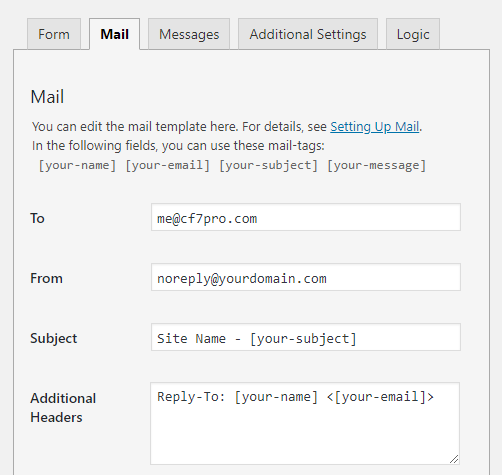 Using Reply-to: in the Additional Headers field allows you to safely reply to a form submission. You can safely use [your name] <noreply@yourdomain.com> to be able to sort by the name of the sender & apply filters in your email application.